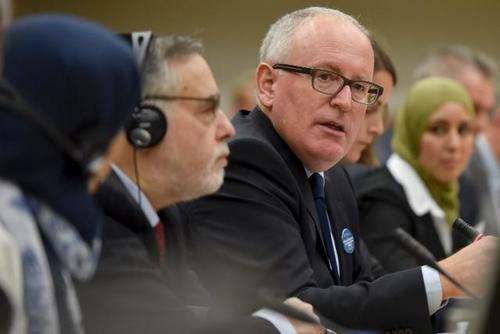 Frans Timmermans, first vice-president of the European Commission, made the announcement on Thursday at a EU colloquium on anti-Semitism and Islamophobia. “The importance we attach to fighting anti-Semitism and anti-Muslim hatred also means that we do not just want to listen to you and your concerns today,” Timmermans said in a speech during the event, which his office titled the first Annual Colloquium on Fundamental Rights in the European Union. Timmermans’ announcement came one day after the Fundamental Rights Agency (FRA) — the EU body responsible for countering discrimination and racism — published a report that spoke of underreporting that hampers its efforts. The report noted that only two EU member states, Hungary and Sweden, recorded a decrease in anti-Semitic incidents. Belgian, French, Czech, and Dutch watchdog bodies reported sharp increases, while 13 member states either recorded zero incidents (Croatia, Cyprus, Latvia, Luxembourg and Slovenia) or had no official or unofficial data. I can't begin to tell you how glad I am that you are all here. This for me is already at the beginning a highlight in my career as a member of the European Commission. It is something that I have worked for for a year, and now that you are all here, I hope we can have a fruitful couple of days. I am very honored by your presence at the first annual Colloquium on Fundamental Rights, and I strongly believe that we chose a topic that is of, I would almost say, existential importance to the future of Europe. This Colloquium is the first but it is not a one off. Fundamental rights is a responsibility I attach the highest importance to within my portfolio. I announced the Colloquium in the European Parliament a year ago, and I want to bring together once a year and around the same table, politicians, practitioners, institutions, NGOs, to build together a clear understanding of the situation of fundamental rights in Europe today. Taking time to listen, to confront our experiences, is equally vital to every one of us in helping us deal with the difficult issues we all grapple with separately. And I think it is hugely symbolic that we have decided to devote this first Colloquium to antisemitism and anti-Muslim hated. I feel very strongly about both issues. We decided on this theme at the beginning of the year against the backdrop of devastating terrorist attacks, the ghastly rise of antisemitism it exemplified, the fear of a backlash it released, the general malaise in our society it revealed but also the wave of civic mobilisation that it sparked across Europe. It was a crucial topic then and today, as hundreds of thousands in need of refuge are arriving on our shores and the capacity of our society for tolerance and inclusion is put to the test like never before. There couldn't be a more burning issue. Europe is going through a period of crisis and turmoil, which is challenging the very values on which it was built. It is challenging the very fabric of European society and therefore the very fabric of European cooperation. The rise of antisemitism, the rise of Islamophobia, each in their own way are symptoms. I know very well, ladies and gentlemen, that our decision to address both issues in the context of this Colloquium was a controversial one. Each is complex. Each is a unique phenomenon with its own roots, its own forms, its own impact. And each, yes, would deserve a Colloquium in its own right. We are not lumping them together. I know perfectly well that they are different phenomena with different histories, with different backgrounds, with different manifestations, with different levels of violence seen, etc etc. I know that very well. But what these phenomena do have in common is that they affect communities which are, each in their own way, seen as different from the majority, and which therefore risk being exposed and targeted when scapegoats are sought. But through their extreme nature and the difficult discussions they trigger, antisemitism and anti-Muslim hatred are emblematic of other forms of hatred. At the bottom of all forms of hatred, is the fact that you are targeted purely for who you are. No matter what you do, or what you say, you are targeted for who you are, something you can do nothing about. It's just who you are. Whether it's being scared of wearing your headscarf in public places, or covering your kippa with a baseball cap. Not being able to go about your daily business without a knot in your stomach, knowing the casual insults, the jokes, the abuse won't go away. The fear that your child's school, your local supermarket might be targeted by people who hate you for who you are. About a year ago I started losing sleep over the headlines about Aliya: Europeans leaving Europe, today's Europe, because they no longer see, as Jews, a future for themselves here. Without our Jewish community, Europe would cease to exist. Europe would simply cease to exist. When you know about European history, you know that the darker, uglier forces in our societies always turn first against minorities. Always turn first against Jews. And when you know anything about European history, you know that anti-Semitism is a triple red line, never, ever to be crossed, for our collective sanity. Anti-Semitism is not just terrible for the Jewish community, it is like a fever in an infected body; it points at a much wider problem. Anti-Semitism left unchallenged will create a much, much bigger problem in any society, that is what European history teaches us. So tackling antisemitism is an essential operation to save what we cherish in our society. The fact that today, in Europe, antisemitism is still a reality, and that it is in fact on the rise – old antisemitism that we have known for centuries, and new antisemitism, that sometimes tries to hide itself behind anti-Zionism – is something we need to confront. I don't want European children to grow up with police at their school gates; it is a dark, dark stain on our collective conscience. There is a book by one of my favourite German authors, Erich Maria Remarque. It's called 'Liebe deinen Nächsten' – I think the title in English is 'Flotsam'. He wrote it in 1939, and it tells the story of three Jewish exiles drifting across Europe. Their daily fears. The grim reality of exile. It's been with me every day these past few weeks. Now that we see the waves of refugees reaching our continent - and these refugees are actually going through exactly the same experience as the Jewish refugees were from Germany in the 1930s, sometimes deeply traumatised by what they experienced back home, like the characters in Remarque's books. Sometimes met with extreme forms of deep humanity by the people in the countries where they arrive, but also met with racism, violence, discrimination in the countries where they arrive. So we never learn. We never learn. It is no different. The only thing that is different is that the refugees today come from somewhere else and have a different background. In the past weeks, we have seen tremendous solidarity in some of our Member States. But we have also seen the dark side of society. We have seen the homes of asylum seekers set on fire. And we have heard political leaders declare that their countries would not accept refugees if they were Muslim. Anti-Muslim incidents are multiplying across Europe. We're seeing a huge spike of attacks. Verbal insinuations, closed-mindedness, prejudice, discrimination. The rise of islamophobia is the one of the biggest challenges in Europe. It is a challenge to our vital values, to the core of who we are. Never has our societies' capacity for openness, for tolerance, for inclusion been more tested than it is today. Diversity is now in some parts of Europe seen as a threat. Diversity comes with challenges. But diversity is humanity's destiny. There is not going to be, even in the remotest places of this planet, a nation that will not see diversity in its future. That’s where humanity is heading. And those politicians trying to sell to their electorates a society that is exclusively composed of people from one culture, are trying to portray a future based on a past that never existed, therefore that future will never be. Ladies and gentlemen, we are all here to listen. I am here to listen. And I want to encourage you to share your experiences, but above all your ideas on very concrete ways in which we can fight back against hatred and intolerance in Europe. Think about the things we could do in education; create meeting places where people can come together. Look how we can tackle hate speech on the Internet and in other places. Together, we will take stock of the main challenges faced by the Jewish and Muslim communities in Europe today. And together, we will explore solutions, from the fight against hate crime and hate speech to the role of civil society, education and local authorities to policies promoting non-discrimination and inclusion. This round table is not just symbolic. This table, around it, we have an enormous wealth of experience and insight which can help us find new ideas and solutions. Together with Commissioner Jourova, we would like each and every one of us to leave tomorrow with a to-do list of very concrete points, of very concrete commitments. The importance we attach to fighting antisemitism and anti-Muslim hatred also means that we do not just want to listen to you and your concerns today. It means that we remain there to listen and help also when this Colloquium is over. For this reason, Commissioner Jourova and I have decided that we will designate, within the Commission, two coordinators with specific responsibility for following issues relating to one, anti-Semitism and the other, Islamophobia. So one coordinator responsible to be your contact point on issues relating to antisemitism, another coordinator responsible as your point of contact for issues related to Islamophobia. And these two persons within our services will have direct access to me. So whatever you say to them lands on my desk immediately. I want to be in direct control of this I will be your envoy if you want to call it that. I will have two people in my services whose task it will be one, to make sure that the issue of anti-Semitism is her or his main activity, and the other, Islamophobia, and that they report to me directly so I know what I need to do when there is an issue at hand. I look forward to your exchanges – and have no doubt that they will be lively. You know, what makes us Europeans is not just the capacity to express ourselves and to be understood, but more than that it is the capacity to listen to others even if we don't agree with what they have to say.